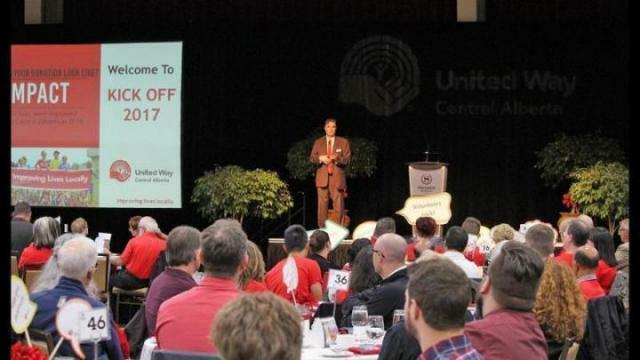 Sep. 14, 2017 1:00 p.m.
A sea of nearly 400 red-clad supporters filled the Sheraton Red Deer Hotel on Thursday at noon to help kick off United Way Central Alberta’s 52nd campaign. “We support over 40 different programs and we just try to make the impetus for getting people to understand the money raised locally stays locally, and we’re improving lives locally in our three different area that we talked about,” said CEO of United Way Central Alberta Robert Mitchell. Presented by Johnston Ming Manning, LLP in partnership with the Sheraton, the kick-off event marks the start of the four-month fundraising drive to support more than 40 programs and services in three priority investment areas. Those three areas are education, income and wellness. “Education is all about helping kids to be all they can be and about getting kids to reach their full potential,” said Mitchell. Income is about moving people from poverty to possibility, getting people off that cycle to poverty. And wellness is helping to build strong and healthy communities. During these challenging times in Alberta, United Way has adopted an appropriate theme for the campaign – ‘Improving Lives Locally’. Both the fundraising and community investment decisions are executed by teams of dedicated volunteers who support United Way’s approach of creating lasting positive community impact. Mitchell said the community support has been outstanding. The backbone of their support, he said, is payroll deductions from the various companies that support them. This year, fundraising efforts are led by volunteer Campaign Cabinet Co-Chairs owner of Corquest, Linda Wilson and City Councillor Ken Johnston. Highlights of this year’s kick-off include creative visual pieces that illustrate what improving lives locally means to United Way Central Alberta and their supporters, as well as moving, real life stories told by people whose lives have been transformed by United Way’s support. Johnston said when it comes to raising money workplace campaigns are always a focus this time of year. “A lot of companies that have come out here this year have incredibly creative and imaginative workplace campaigns. They have a lot of fun and they engage their people,” he said. He said it’s also about basic economics. Johnston said people can expect an exciting announcement around mid October, related to the United Way.